"Rich and satisfying." --LuAnn McLane, author of "Whisper's Edge"
Ean Fever is burned out by the hectic pace of New York City and his cutthroat law career. Longing for a sense of community, he's returned to his hometown of Trinity Falls, Ohio. Maybe he can even help save the Town Center from greedy developers looking to destroy its small businesses--like Books & Bakery, owned by Megan McCloud. Megan was once an awkward girl next door, but Ean discovers she's grown into a strong-willed, beautiful woman. . .
Megan isn't the only strong-willed McCloud. Her cousin, Ramona, is the town mayor. And as usual, Ramona is trying to take away what Megan wants most. As teenagers, that meant Ean. Now Ramona wants to take away her business. But Megan has learned how to fight. And she soon realizes that Ean is ready to fight with her--and for her. Because when Ean finds himself falling for the woman who's adored him all along, he'll have to convince her that he's not leaving again. At least not without her. "The writing is clever and funny." 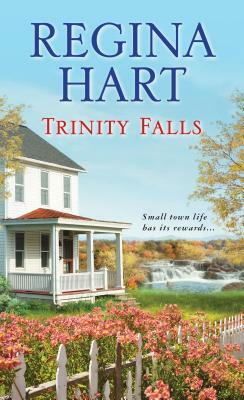 --"RT Book Reviews "
"Hart raises issues such as love, trust, commitment, family, work, marriage and dreams." --APOOO Book Club.